GORGEOUS VIEWS, SUNNYBREEZE GOLF & COUNTRY CLUB, COMMUNITY BOAT RAMP, FISHING PIER AND WELL APPOINTED THREE BEDROOM TWO BATH HOME WITH IN GROUND SPARKLING HEATED POOL IS JUST THE BEGINNING OF ALL THIS HOME IN THE LOVELY SUNNYBREEZE COMMUNITY HAS TO OFFER. This home is just breathtaking with a great split floor plan, open kitchen with breakfast bar and plenty of cabinet space, huge master suite with walk in closet and built in dressing table, large family room and living room that opens to the screened in sparkling pool area with outside built in BBQ grill for entertaining, quaint landscaped courtyard with irrigation and curbing, 2-wells, over-sized 2-car garage with extra storage, workbench and sink, security alarm, outside lighting and located just a couple doors from the clubhouse. 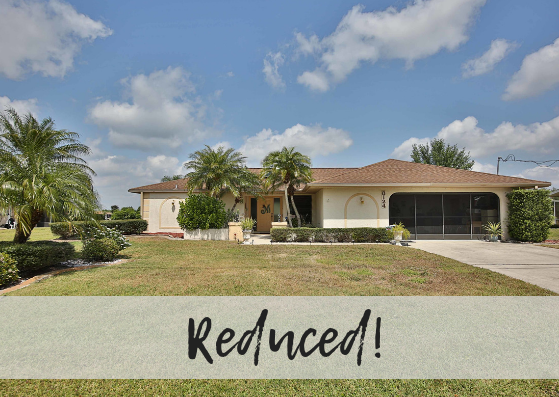 With just minutes away from I-75, Port Charlotte, Punta Gorda but in a quiet popular quaint rural community, this could easily be your winter retreat or a full time home.